Helping students identify strengths and weaknesses in their research strategies. Ann Montgomery discusses how Britannica School has helped their teachers and students with digital learning resources in the classroom and library at Bury Grammar School. Both our primary and secondary schools needed easy access to quality information, and specifically we needed a resource that we could use in our Year 7 Library and Information Skills lessons. Our students have previously been exposed to an overload of information. They accessed information via internet searches and did not always select the most appropriate or accurate sources for their information needs, from the plethora of results which would be returned. It’s a great introduction to database searching and is central to our teaching of information skills in school. The access to quality information that is pitched at different levels is great. We can use it during lesson times to help students identify the strengths and weaknesses of their search strategies, and understand resource organization. It is also a good starting point for broader discussions about understanding the purpose and use of different types of information. Britannica’s reputation, authority and ease of us made them stand out for us. The ability to access information at different levels makes an ideal whole school resource up to Sixth Form and for use by Teachers. We particularly like that the content draws on a variety of media including ImageQuest and offers links out to other recommended sites. 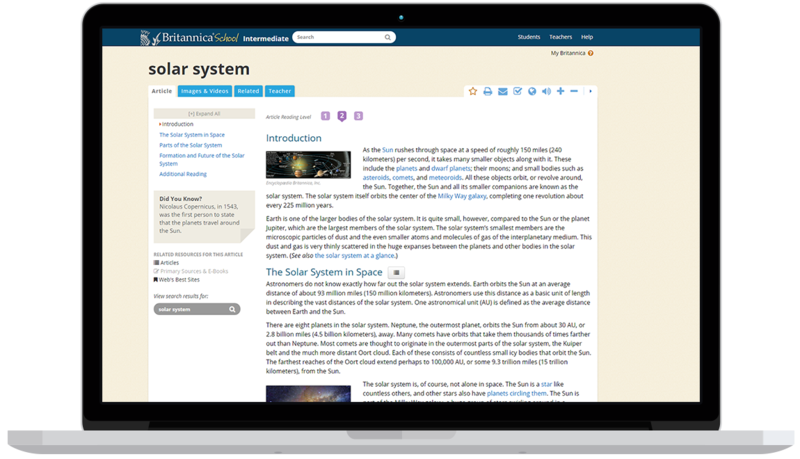 If you’d like to know more, visit our Britannica School page here, or contact our team and we’ll be in touch to arrange a short demo.